It is an epic classic and perhaps a bit too obvious of a choice for anybody's list of great films, but this film does have a special place in my heart. When I was 17 years old, Christ found me out and I became a follower of Jesus. My life was totally changed, and I saw everything differently. I'll never forget the true excitement of celebrating my first Christmas after abandoning atheism and finding the true Creator. There's just nothing replacing that period of my life. A few months into my new life, I decided to watch Ben-Hur. I knew nothing about it. Nothing. 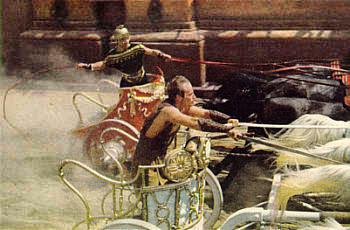 I only knew that it had a chariot race, and that many regarded it as one of the greatest films of all time. As I watched, I became slack-jawed as I realized that this beautiful film epic was actually a movie about Jesus. I really couldn't believe it. As I watched this story of revenge unfold before me, I was thrilled by its epic quality, blown away by Charleton Heston's voice, and moved by the tale I was seeing. The scene where Ben-Hur falls to the ground because the Romans will not give him a drink, you feel true despair and empathetic thirst. But when Jesus comes and he drinks deeply from Christ's cup you not only feel the symbolism, you sense that Jesus is the only one in this crazy, cruel story who really brings any hope. I still shake tearfully when I watch that scene. But Christ seems so peripheral to the story that you almost wonder if the subtitle "A tale of the Christ" is really appropriate. But of course you'd be wrong. You really feel that if only Judah Ben-Hur could have his revenge, everything really would be solved. And those around Ben-Hur feel it too. 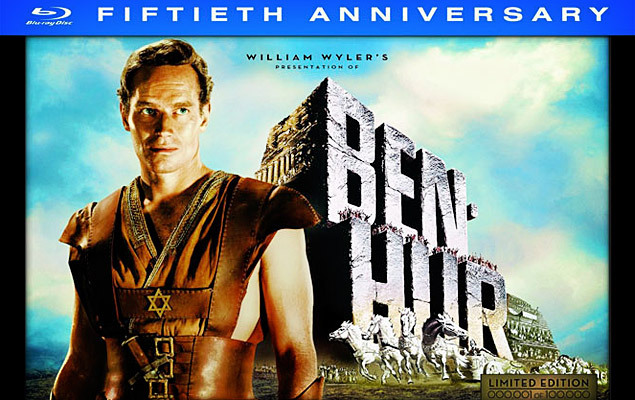 At one point, Ester says to Judah, "It was Judah Ben-Hur I loved. What has become of him? You seem to be now the very thing you set out to destroy, giving evil for evil! Hatred is turning you to stone. It is as though you had become Messala!" In this sense this film really is the anti-Gladiator. Whereas revenge satisfies Maximus (not for long, of course), Judah is a bit too thoughtful to settle for spilling his enemy's blood. He tries it at first, to be sure, but it is an empty and shallow victory. Once revenge is taken and you think that a resolution has been found, the movie keeps going. We soon see that Ben-Hur has no peace. In one of my favorite lines from any movie, Judah Ben-Hur takes a drink from a river and says, "When the Romans were marching me to the galleys, thirst had almost killed me. A man gave me water to drink, and I went on living. I should have done better if I'd poured it into the sand...I'm thirsty still." The fact that Ben-Hur only finds peace by encountering the crucified Lord felt like the most truthful conclusion of any movie I've ever seen. Many times we get a taste of the truth, but it felt like Ben-Hur gave us the whole truth. In one sense, what more could you ask for from any movie? The movie is filled with beautiful lines. During Christ's crucifixion Balthasar says, "I have lived too long." At one point, Ben-Hur's leprous mother and sister are leaving their cave and Miriam says, "I'm afraid," to which Esther replies, "No cause. The world is more than we know." In another line which still brings tears to my eyes, Christ is passing Ben-Hur carrying the cross to which Ben-Hur says, "I know this man!" I don't know why that line gets me, but it does every time. Ultimately, this film made a tremendous impression on me at a very important time in my life, just like the other two movies on this list. I was encouraged in my discipleship by it, I was convinced that only Jesus brought real and lasting peace to the wounded heart, and most importantly, I glorified Jesus as I watched it and whenever I remember it. I always appreciated that they never showed Jesus face as well, although it's hard to deny that their Jesus looks an awful lot like a western european non-Jew. In the end, finding the movies that will make the most impact on us are a crap-shoot. You don't really know until a century passes what has and hasn't affected the way you think and how you process the things you encounter in life. A friend asked me if The Tree of Life was my new favorite movie and all I could say was, "I'll tell you in ten years." Coming tomorrow: My favorite movie of all time and the one film that has had the greatest impact on my life.